Earlier this week Liverpool’s Mayor revealed a hate filled letter he had received from the self styled ‘National Action’ group. In it they promised the biggest Neo-Nazi march in decades. They threatened to burn the city down and commit hate crimes if he tried to ban it. In the end they failed to get out of Lime Street station. Their 25 strong ‘movement’ spent the day cowering behind shutters in the lost luggage room. Humiliated, they cancelled their own march. It seems the city of Liverpool will not be cowed by threats from the far right. There are some who have invoked freedom of speech to suggest the march should have been allowed to go ahead unmolested. I respect this point of view. I support wholeheartedly the ‘Human Rights Act’ of 1998. However, incitements to racial hatred are not in keeping with the spirit of this act, nor do they fit with principles of democracy and freedom. Freedom of speech is not absolute in law. There is no right to incite hate crimes. Libel and slander are also illegal. As a society we are rightly prepared to draw the line in terms of what is acceptable free speech and what constitutes bigotry and hatred. Despite this Theresa May, the only person in law who could have banned the march, declined to do so. 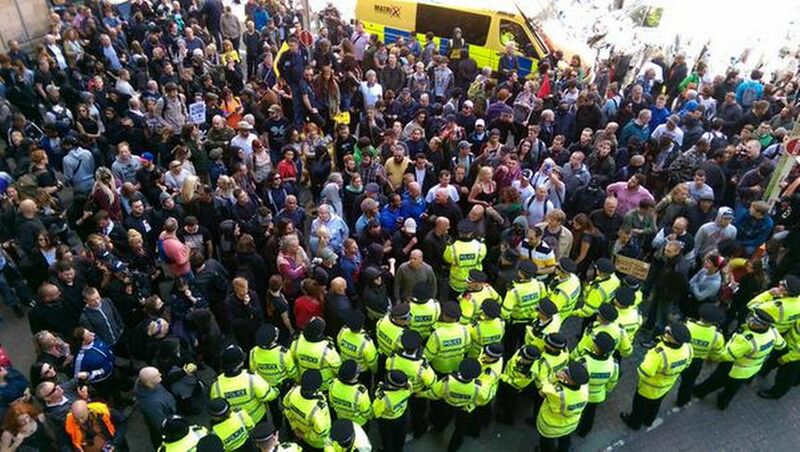 It was therefore left to the people of Liverpool to exercise their right to say no to the fascists. Liverpool is an ethnically diverse city and proudly so. It was built by hundreds of thousands of immigrants from Ireland, Africa, China and Asia. In the Spanish civil war Liverpudlians volunteered to fight Franco and this city suffered as much as any at the hands of Hitler’s Reich. There is a strong radical tradition here of rejecting narrow nationalism in favour of solidarity and internationalism. Today marked the tenth anniversary of the horrific death of Anthony Walker, a young black boy murdered by racist thugs in the city; a crime met with revulsion across the city. Many attended a festival in his honour at the same time ‘National Action’ were arriving for their march. Frankly these bigots couldn’t have picked a worse time or place for their obscene posturing. Or maybe that was the point. Their leaflets and pamphlets boasted that they were ‘Commie’ busters; a reference to the fact that they see Liverpool as a left-wing city. I think it is, but I’d be guilty of stereotyping if I assumed that all Scousers identify themselves that way. The reality is that the population here is politically and culturally diverse. There are those who don’t see themselves as ‘lefties’ but they are strongly opposed to injustice and believe passionately in fairness and equality just the same. ‘National Action’ felt the full force of this today. Many came from far and wide to stand in the way of the racists, but they were joined by a strong and determined Scouse contingent. Their accents can be heard on viral videos shared on social media. Mixing anger with humour, they chanted “master race , you’re having a laugh,” as a forlorn looking bunch of thugs, heads bowed, stared at their jack-boots. 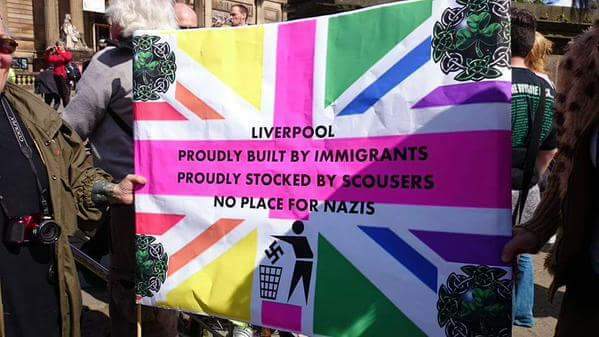 There is no place for Nazi’s in Liverpool. It’s been thirty five years since their last attempt to take on the city. They failed then, just as they have now. I am proud of my city today. I’m glad I live in a place where people won’t tolerate such hatred and where fascists are humiliated and driven from our streets.